As someone who, along with Darcy, works on dozens of PCs each week, I can tell you from personal experience there are a lot of people getting scammed every day – and not just for a couple of bucks – but for hundreds of dollars. Sometimes I tend to think people get a little careless out there on the ‘net at times, and I’m sure they do – all of us do. But today I got a taste of what a lot of these poor folks who are scammed out of hundreds of dollars run into on the web. And it’s not pretty. This morning, I was going to a site I visit quite often when suddenly I noticed a horrid beeping coming from my laptop speakers – the dire beeping of a dying hard drive, a terribly sick PC or some other unseen and unknown computer malady were my first thoughts. Notice at the top of his screenshot that it says “Virus alert” and in the background it looks like a computer screen (my computer screen) with a bunch of fatal errors being displayed. This kind of sleazeball scam with all these dire warnings, awful computer noises, and a browser that you can’t easily close, is a scam designed to scare those are are no computer savvy. When they panic, they don’t think, and they call the toll-free number. But they can’t fool you, I tells ya! YOU can beat these slimeballs. Notice above, that my REAL ISP and my REAL IP address are displayed, which I imagine causes panic in those who don’t know that every browser broadcasts your IP address, location, your ISP and a lot more information about you. If you don’t believe me, just visit http://www.whatsmyip.org/ and see how much data your browser broadcasts about you. Will all this info broadcasted from your browser constantly, it’s really easy for these scammers to tap into that info stream and make it look like there is something very wrong with your computer – after all they have your ISP, your IP address, your operating system (even 64 or 32 bit) and the name of the browser you use. All very convincing. And though they try to make it seem personal by showing your personal IP address, browser & operating system, and name of your ISP, you’ll notice they don’t say “Dear TC”, Dear Charles, “Dear Sally”, etc., they just say “Dear Time Warner Cable Internet Llc Customer”. They misspelled LLC as Llc as well. “Dear customer” is usually a dead giveaway that something’s not right. Then they tell you that “for your safety”, you won’t be able to close your browser unless you call their toll-free number and talk to a “certified technician”. More like a certified slimeball! And sure enough, when you try to close your browser, you can’t close it. Instead you hear more awful beeping sounds. Everything is intended to induce panic, and get to you to call some slimeball company’s toll-free number. If you do call, they’ll set you up – really set you up. When you call their toll-free number, they will give you a link to connect to them so they can “analyze” and “fix” your computer. And of course, they’ll run fake scans on your computer showing a litany of fake PC-killing malware and viruses. They’ll show you hundreds, even thousands of fake files that they will say are infecting your computer – and for just $99 or $199, or even $299 – they can clean all this bad stuff off, fix your computer, protect your identity and save your computer from a terrible fate. And sadly, many people, pay the slimeballs. We have known people who have paid up to $500 these scumbags (we helped them get their money back). If you panic, you’re going to get scammed Keep your head- it’s only a PC not a life. Microsoft nor any other legitimate computer repair company is ever going to show you a warning like the one above – not now, not tomorrow, NOT EVER. 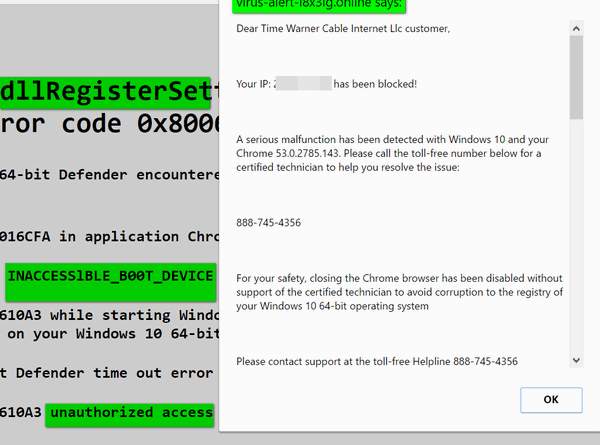 If you see a popup like that, that tells you your computer is infected or has serious errors or both and asks you to call a toll-free number..CLOSE YOUR BROWSER IMMEDIATELY. a warning that certain programs are open and need to close before you restart – do not click Cancel. Let Windows close all programs and reboot. d.) Completely power off your computer and leave it off for a few minutes. Then turn it back on. These scams are everywhere. No antimalware or antivirus can stop you from picking up the phone and calling a tool-free number. But you can protect yourself. Never panic. When people panic, sometimes they don’t think clearly. And remember that these scumbags are smart… but you are smarter. Think ahead. Be prepared for something like this, so if something like this happens to you, you’re ready, and you know exactly what to do. Always use common sense. Never ever call a toll-free number which appears suddenly while your browsing the web/ Never give give these slimeballs your credit card number. Never give them access to your computer by allowing them to connect remotely. Look carefully at the pictures above and familiarize yourself with them. Then follow the tips in this post, and you’ll know how to get yourself out of a situation like this. Don’t let Slimeballs Inc. steal your money or ruin your computer. Now you know what to to do. I HATE these people that do this but then again scams have been around since man was born! Thanks for the update. Thanks guys…I’ve typed the info in case I’m attacked. Everyone should do the same. Thank you so very much for this article. I had this to happen to me a few days ago and I could not get out of that window at all. So I had to use my task manager and hope I have not done any damage to my desktop. Now I am going to book mark this page and the next time I need it I will know where to look for your help. Thank you and bless you for this article. Yesterday, while trying to view on my PC an episode of a TV program I’d missed, all of a sudden I’m hearing very loudly from my speakers, “You have a virus, DO NOT TRY TO LEAVE THIS PAGE” and a lot of other scary stuff and they said I had to call a phone number which they gave. They said they disabled my computer, but fortunately, only last week, you gave us this article telling how to get out of something exactly like this – I had printed it out and kept it nearby so I scrambled for it and then tried to do what it said, but I couldn’t get to Task Manager as they wiped out the bottom part of my screen. But while hitting Ctrl+Shift+Esc with my left hand, I was able, using my right hand and cursor, to close the window with the X in the top right corner, then turned off my computer and a few minutes later, restarted it. All was and is well. Whew!! There are some horrible people out there just trying to harm and scam innocent people, but Cloudeight to the rescue. Again, thank you doesn’t seem adequate. I’ve been hearing about this, but it was good to see the screen shots and you giving us the exact procedures to take. Thanks much! This is the first time I’ve heard about this type of scenario by scammers attempting to acquire your credit card account number. I’ve gotten the “Microsoft” phone calls (2 just this past week) but nothing actually appearing on my PC . . .yet. I will spread the word and this article to all my friends and family. 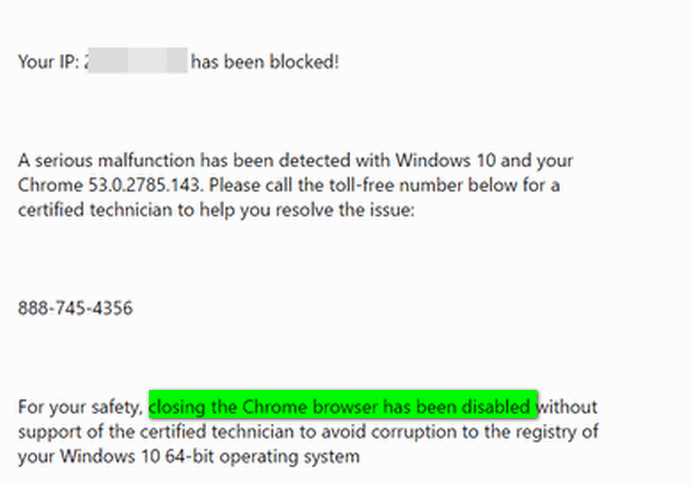 I guess something like this is not something that Emsisoft is able to detect as a virus or malware? thank you for this valuable info!! I have written it down and taped it to my desk. Have had several of these scams before and did,nt know how to cope. Now I do.